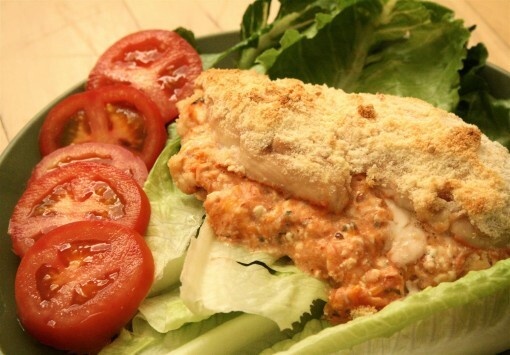 Three Cheese Stuffed Chicken Breast was posted on October 28th, 2013 and is filed under Low Carb, Main Dishes, Protein, Recipes. This entry has 4 comments. You can follow any responses through the RSS 2.0 Comment Feed. Thank you to NatureRaised Foods for sponsoring this article. Learn how NatureRaised Farms® is “Doing What’s Right, Right from the Start™” in your area. I’ve been working more on meal prep these days. I’m in a hurry, and my easy, fast recipes keep getting faster. I think cooking/baking should be a relaxed, laid-back experience…and it hasn’t been lately. However, I’m working on it. I’m trying to literally give myself an hour or more just to do some meal prep and allow myself to make something special for dinner. Not just my typical smoothie (always!) or my quick low carb pizzas. This recipe is still ridiculously easy and fast to make, but it does take about 20-25 minutes to bake. This gives you time to make a lovely side salad and a homemade dressing. I’m learning you can’t rush all the time, and this recipe is so delicious and beautiful it makes dinner special. It’s also gluten free, low carb (no bread in the coating), and decadent. This serves 2. Mix up the cheeses, parsley, and pasta sauce separately. 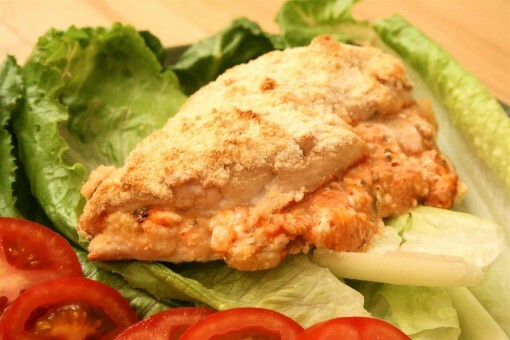 Slice through the side of the chicken breast and stuff it with half the cheese mixture. Place on a pan with parchment paper on top. Brush egg white on the chicken. Roll the chicken in a half and half mix of coconut flour and Parmesan cheese. Bake until the chicken is done, which translates to 20-30 minutes, depending on how big your chicken is. Serve with vegetables. As for the kind of chicken to get, while I can’t always get the more naturally raised chicken…it’s always preferable. I really appreciate that about NatureRaised Farms – their chicken is all-natural in the truest sense. They take pride in the fact that our farmers and producers never add hormones, steroids, or antibiotics to the chickens—and never will. I think all farms should be like that. While I’m certainly not vegetarian, I think commitment to animal welfare (humane treatment) is important. Plus, the end product just taste better! Have you tried Nature Raised chicken? What’s one of your favorite chicken dishes? I want to try this!! It looks so deelish! Looks tasty! I recently made/created a Moroccan Chicken recipe – full of flavor and spice. It has quickly become a favorite to make and eat! I’m an avid stuffed chicken breast fan. My favourite being craisins, feta and spinach but this recipe might just top it! Yum! Oh, this looks really delicious! Clearly, I need to start stuffing some chicken around here.